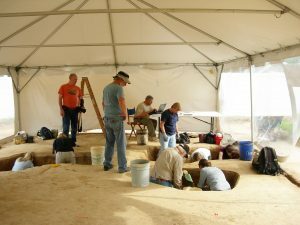 REHOBOTH – An archaeological study years in the making has revealed a wealth of new information about some of Delaware’s earliest colonial settlers and shed new light on what life would have been like in the region three centuries ago. The site of the discoveries is Avery’s Rest, a 17th century plantation located in what is now West Rehoboth. The original owner was John Avery, who once served as a judge in nearby Lewes in the period just after the colony transitioned from Dutch to English rule. Designated a historically significant site in the 1970s, Avery’s Rest was slated for development in 2005, which spurred the first round of excavations and surveys at the property by the Archeological Society of Delaware in collaboration with the Delaware Division of Historical and Cultural Affairs. Over the next few years, archeologists continued to work the site and branch out into neighboring parcels, uncovering artifacts and evidence of structures from the original plantation. 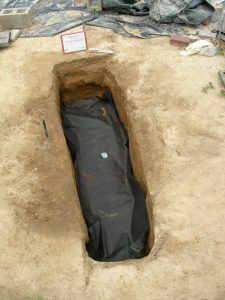 The first burials were discovered in 2012. This triggered a legal process under the state’s Unmarked Human Remains Act, which identified three known descendants of John Avery. With their consent, the state engaged Dr. Douglas Owsley of the Smithsonian Institution for his expertise in the field of physical anthropology and his well-known work with early colonial settlements at Jamestown, Va. and St. Mary’s City, Md. The remains were excavated and transferred to the Smithsonian for advanced DNA testing under Dr. Owsley’s supervision. Bone and DNA analysis confirmed that three of the burials were people of African descent and eight were of European descent. Coupled with research from the historical record, Dr. Owsley further determined that the European burials may be the extended family of John Avery and his wife Sarah, including their daughters, sons-in-law and grandchildren. However, genetic markers alone are not sufficient to determine the exact identities of the remains. The remains will stay in the custody of the Smithsonian, where they will assist ongoing work to trace the genetic and anthropological history of the early colonial settlers of the Chesapeake region. Delaware law strictly forbids the public display of human remains. In Delaware, the Division of Historical and Cultural Affairs will continue to work with the Delaware Historical Society, the Archeological Society of Delaware and others to craft a plan to exhibit the Avery’s Rest findings for the public. • Sept. 2014 – Memorandum of Agreement signed by Historical and Cultural Affairs, Smithsonian, Archaeological Society of Delaware, and next-of-kin for Smithsonian excavation of the burials, with Historical and Cultural Affairs oversight; remains are transferred to the Smithsonian.